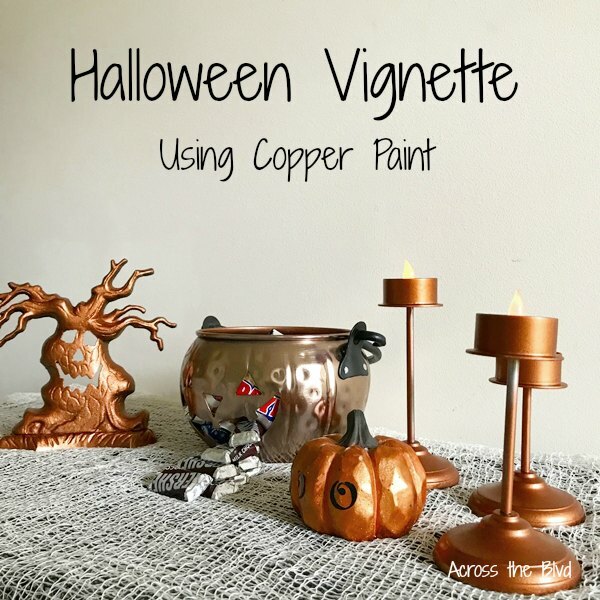 Create a not so spooky Halloween vignette using copper decor. Spray paint assorted pieces to match any look quickly and easily! Using copper items I already had and spray painting other items to match had the vignette coming together quickly. 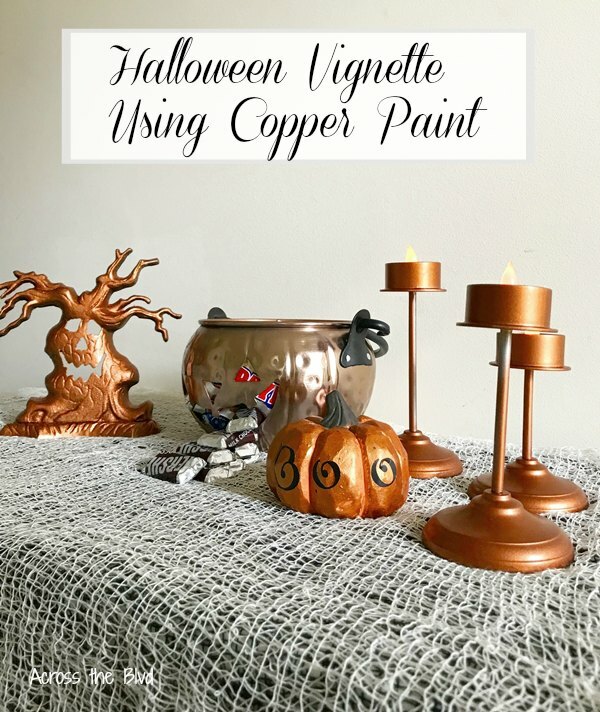 I wanted to use copper for a Halloween vignette to match lots of the copper accessories and decor pieces I have. 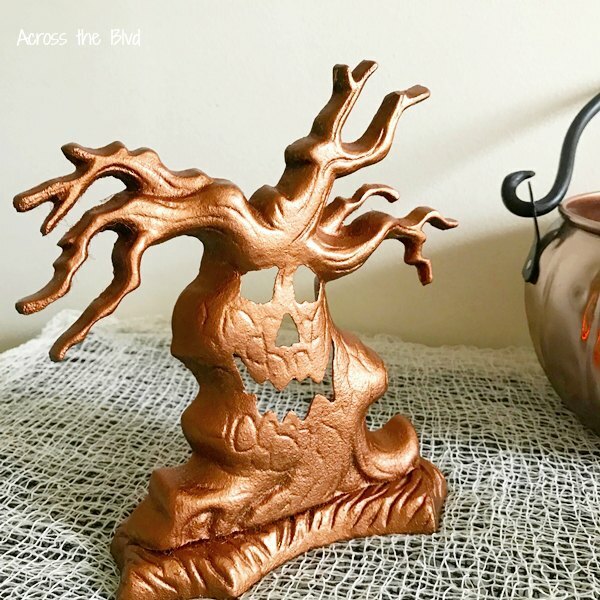 When I found a metal Halloween tree at my local Goodwill recently, I knew it would be great for the vignette with a simple coat of paint. 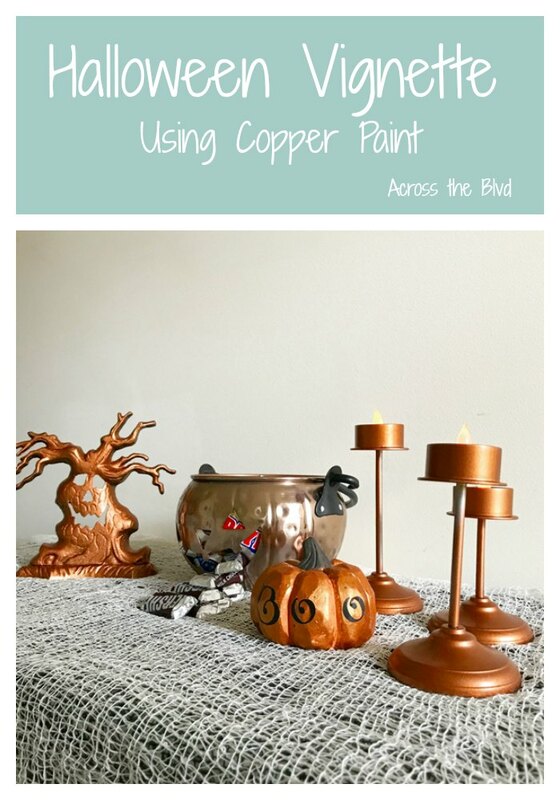 Old candle holders, a copper pumpkin, and a copper jack-o’lantern complete the look. 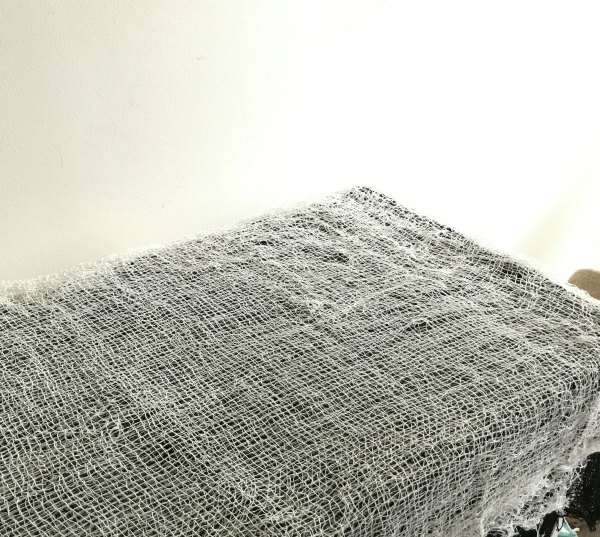 To cover the table, I bought two packages of Creepy Cloth at the Dollar Tree. The bottom one is black with a white one on top. I neglected to take a photo of the Halloween Tree prior to spray painting it. It was dark with a bronze like finish. It only took one coat of Krylon Metallic Copper Spray Paint to having it fitting in with my other copper items. I like to keep our Halloween decor not so spooky and this tree is more fun than spooky, so it was a great find at Goodwill for .99. I’m still finding items that came from my mother’s house that I can use for crafts or decor. 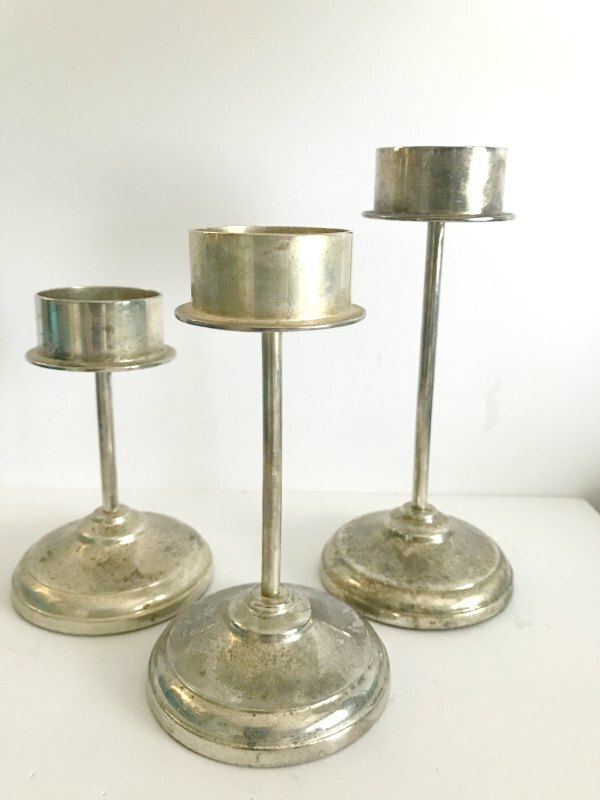 These old candle holders needed a quick makeover. I used the same paint that I used for the tree on these. 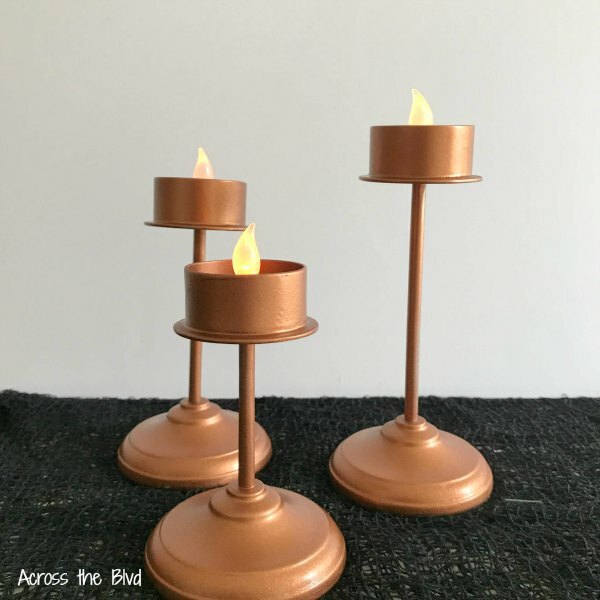 I used the same paint that I used for the tree on these candle holders. The black tea light battery candles came in a set of four from the Dollar Tree. I’ve had this copper pumpkin for a couple of years. I bought it at the Dollar Tree. To give it a Halloween look, I added a vinyl Boo decal like the one I used on the Canvas Bags for Halloween. The inspiration for putting together a copper vignette for Halloween came from this copper jack o’lantern. I purchased this a couple of years ago. This year, it’s filled with candy and has some spilling out. 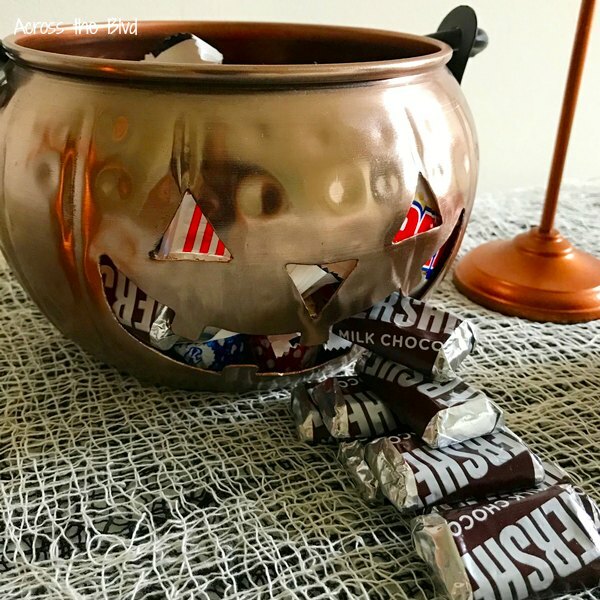 Since I have lots of copper accent pieces in our home, I love finding ways to create seasonal decor that matches. Giving quick paint makeovers to a few items is an easy way to do that. 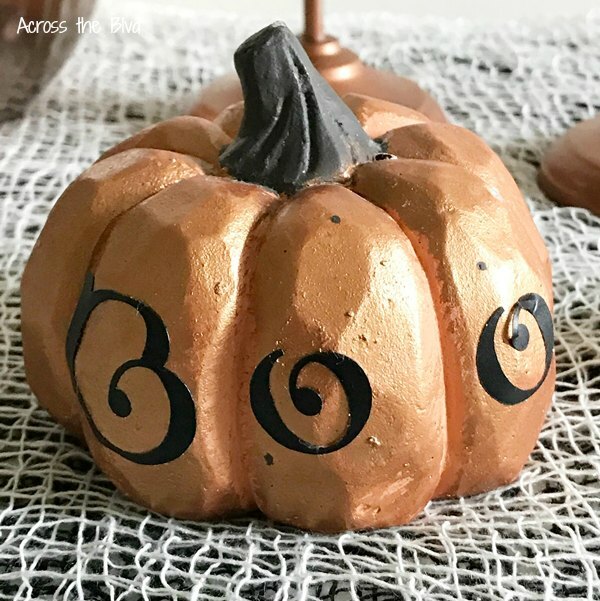 Do you do much decorating for Halloween? If so, do you prefer not so spooky or scary and gory? I dont like gory or spooky. 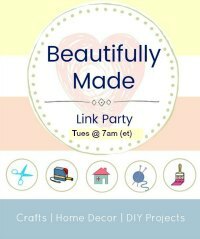 I decorated with good will finds also. Thats where i buy everything. Come over and look. 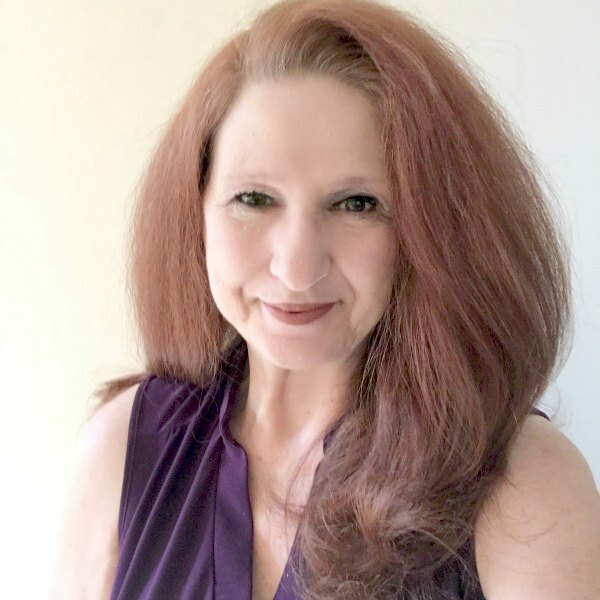 I lost my 10 blog sharing shadymont in cyberspace. 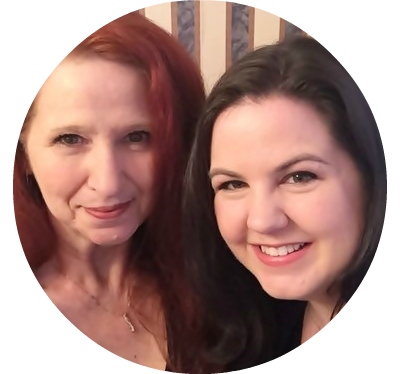 But have started sharing shadymont again. I don’t like the gory, either. Goodwill is a great place to find items for crafting makeovers.